Fernando Alonso: What now for 'embarrassed' McLaren driver? It was said with feeling, and timed for maximum effect. At Honda's home race, on the track it owns, Fernando Alonso left the watching millions around the world in no doubt as to what he felt about the Japanese company's engine in the back of his McLaren. Alonso is paid a salary of $40m (£26.3m), half of it funded by Honda. Regarded as arguably the finest driver in the world, whose words have the impact such a status demands, he used his team radio to describe his car's lack of straight-line speed as "very embarrassing". He likened it to an engine from the GP2 feeder category - where cars have about 600bhp compared to the 900bhp of the engine in Lewis Hamilton's Japanese Grand Prix-winning Mercedes. The particularly humiliating aspect for Honda is that, disparaging as Alonso's remarks are, they are also pretty accurate. He was exaggerating - but only slightly. That is only 60bhp or so more than the difference between Honda's engine and the Mercedes at its worst. In a nation where the idea of honour is a part of the culture, and where loss of face is a serious issue, Alonso's remarks will have hurt Honda badly - regardless of the fact its engineers and management are well aware of its engine's shortcomings. It says something about the size of the crisis facing McLaren-Honda that Alonso's criticisms of his engine were a long way from their biggest problem over the weekend. They were an indication of an even bigger issue - the future of both of their world champion drivers. Formula 1 arrived in Japan with speculation raging about Jenson Button following newspaper reports he was poised to announce his retirement. Within 24 hours there were murmurings that, in fact, it was Alonso's position in the team that was in more serious doubt. At first, this seemed hard to believe - the Spaniard is less than a year into a three-year deal, which he signed after extricating himself from a Ferrari contract that still had two years to run. But it soon became clear that something was indeed going on. "What makes you so sure Fernando will be around next year?" said one senior McLaren figure when the question of Button's future was raised with him. Alonso's manager Flavio Briatore was then quoted in the Spanish media describing McLaren-Honda's season as "a disaster", and saying that if Alonso "cannot get a winning car in Formula 1, he will find it somewhere else". 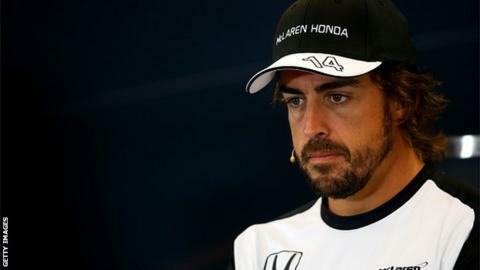 At a news conference on Saturday, Alonso was asked, in the context of Briatore's remarks, whether he was committed to McLaren and would be racing there in 2016. "Definitely I can tell you I will not go anywhere else," he said. "I will hopefully win. I am in this project because I trust this project." That was classic F1 - it sounds like a denial, but it isn't really. There is enough wriggle room in there for it to mean a number of things. I went to find Alonso on his own later and asked him to clarify whether he would definitely be at McLaren next season. "I guess so," he replied, with a big smile, knowing exactly what he was saying and the impact it would have. Then came the race. And afterwards his interview on the BBC. Will we see you in F1 next year? "I don't know," said Alonso. What is Alonso up to? Alonso's outburst on the radio sounded emotional but he is an intelligent and calculating man, and it was clear he was sending a message. Was he firing a rocket at Honda, trying to shock them, to make it clear just how much work needs to be done to become competitive - and that it needs to be done fast? Or was he trying to upset the team, make it clear - if he has not done so already internally - that he has had enough and wants out? On Saturday, Alonso produced one of the qualifying laps of the season. He was 14th fastest, but was only 0.5 seconds off making it through into the top-10 shootout - on a track where 60% of the lap is at full throttle. "I told the guys that lap was probably the best I did around here all my career," Alonso said. In the McLaren news conference later, he insisted he was "happy" in the team, but added: "It is no secret we are here to win and fight for championships, especially after decisions I made last year that I was not totally happy after five years in Ferrari finishing second and third. "I am here to win and, if we are not winning, I can enjoy the process and enjoy working with the guys but definitely you are not so happy when you start 14th after doing one of the best laps I did here in Suzuka. So we need to make this tough time as short as possible." So what will Alonso do now? Dennis said: "We have two drivers. We want both of them in the team. Jenson has a two-year contract and Fernando has a three-year contract. It's as simple as that." Except, of course, it is anything but. On Sunday, Alonso wrote three tweets with the intention, he said, of being "clear". He ended them saying: "No-one should have any doubt that I have three years with McLaren and my career in F1 will end with this team, hopefully winning everything." Nevertheless, there are those - and we're talking serious people, close to the situation - who think it a real possibility Alonso will walk away from McLaren at the end of this season. If he did, it would almost certainly be the end of his F1 career. Unless he and McLaren could come to some form of termination agreement, he would be unable to return with another team until 2018. By which time he would be approaching his 37th birthday. Equally, it is hard to see where Alonso could go to get a competitive car, even if he was free. Although Nico Rosberg's Mercedes contract runs out at the end of 2016, the team would never sign Alonso while Lewis Hamilton is there - and his deal lasts until the end of 2018. Alonso only left Ferrari last season, and his bridges are burned there, and Red Bull have turned him down twice in the past two years. No-one else could afford him, or offer him a potentially winning car. This weekend marked 10 years since Alonso won his first world championship. He followed it up with another in 2006, winning an intense battle with Michael Schumacher. At the time, those titles marked a generational shift, from Schumacher's era to a new one, of which Alonso was clearly destined to be a leading figure. That is exactly what he has been ever since, but that third title - which he craves with a burning ambition that can only begin to be imagined - has proved elusive. He has come agonisingly close three times - in 2007 with McLaren and in 2010 and 2012 with Ferrari. He is eight points short of being a five-time world champion - a tally that would much more accurately reflect his status in the F1 pantheon. "We want both of them in the team and it is as simple as that. We will have a winning team." That he failed to win the 2007 championship was partly his own fault - he "lost it", in the words he used to the McLaren team when he left at the end of the season, when he fell out in the most spectacular fashion with Dennis. At the end of that year, the two parties split - also one year into a three-year deal. In 2010, he missed out because of a catastrophic strategy error by Ferrari in the final race of the season. And 2012 - when he produced one of the greatest seasons any driver has put together - was pure bad luck. But for any one of several incidents, none of which were his fault, he would have won the title. Right now, it's hard to see how he will ever win another. Honda is so far behind that very few people in F1 believe it will ever catch Mercedes, let alone within the term of Alonso's contract. Does he stick with it, and hope for the "miracle from Japan" he referred to in an interview in Singapore a week ago? Or does he just give up now? Button's future is in just as much doubt. He has a contract with McLaren for next year, but the team have an option to terminate it at the end of this month. That contract dictates a pay rise of $5m (£3.3m) to $15m (£9.9m), and Dennis, sources say, has been trying to negotiate it down. It seems he has given up on that strategy and he said after Sunday's race: "I told Jenson - probably too late - that we have no intention of exercising the option. I told him on Thursday; probably I should have told him on Tuesday." But does Button want to stay? If not, they can't make him. Button is not saying, but the general belief within F1 is he does, and will stick it out with McLaren for one more year, hoping for improvement. Television viewers around the world noticed there was very little coverage of Mercedes from Japan, despite the team locking out the front row of the grid and finishing one-two in the race. There are senior figures in F1 who say this is a form of retribution from commercial boss Bernie Ecclestone, who controls the TV coverage, for their refusal to supply Red Bull with engines next year. Ecclestone, insiders say, is also in dispute with the teams about the display of sponsor logos in the garages. And there was a distinct paucity of those broadcast from Suzuka, too. Mercedes F1 boss Toto Wolff was asked about this after the race. "I wasn't sure during the race where we were," he said. "I needed to look at the timing screens because you couldn't see the cars on track. Errr... Our first priority is to win the race. If that is not enough, then this is beyond my control." "Have you upset Bernie?" he was asked, the questioner knowing the answer full well. "It's always very difficult to please Bernie all the time. I need to find out." Was this some form of retribution for Red Bull? "No, I don't think this is linked," he said. Mercedes non-executive chairman Niki Lauda added: "I want to see Bernie next week and ask him what is the reason. If you ask the question, you get an answer." Not many within the paddock have any doubts about what it will be.